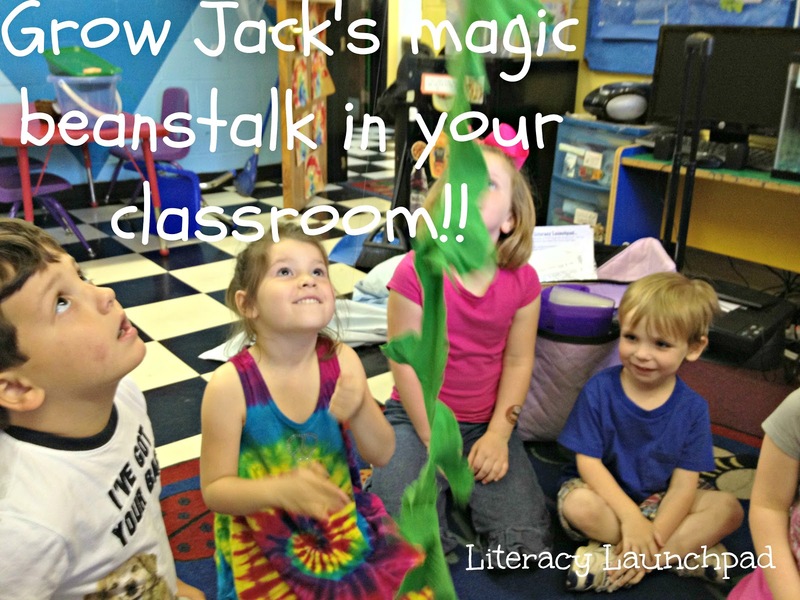 Grow Jack’s Beanstalk in Your Classroom! 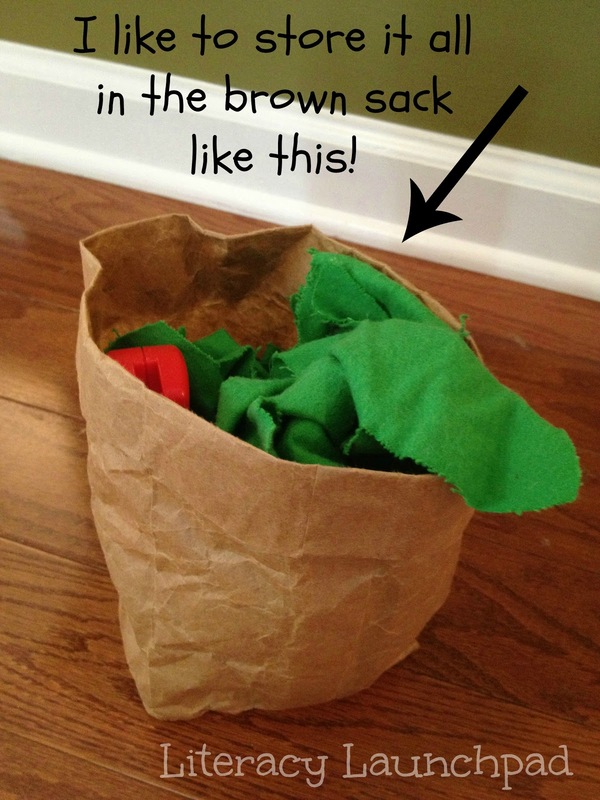 Comments Off on Grow Jack’s Beanstalk in Your Classroom! When I do one of my fairy tale units with my students, I tell them the story of “Jack and the Beanstalk” and use fun props. My magic beanstalk that grows to the ceiling is my favorite prop! 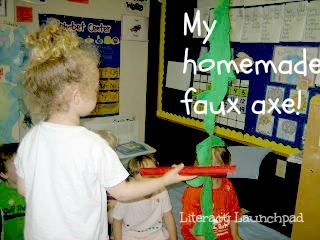 This prop idea came from another preschool teacher that’s a genius, and whom I absolutely adore. I wonder if she knows my students have been loving and adoring her beanstalk prop for years now? 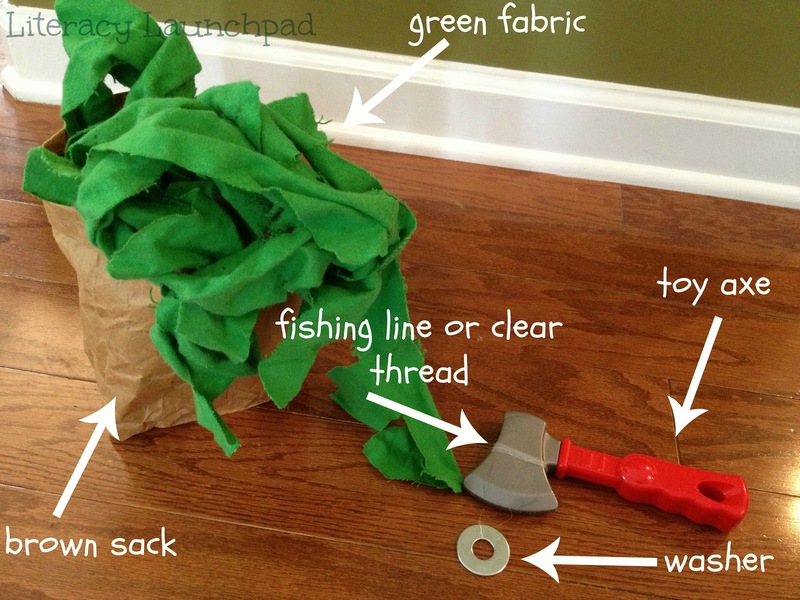 You’ll need everything mentioned in the photo here, plus some scissors, a pencil, a marker, and a sewing needle (don’t worry, it’s just to pull the fishing line through your fabric, no serious sewing involved here!) You choose the kind of fabric you want. I think I just chose a soft, cotton fabric that was on sale. Remember that Hobby Lobby and Joanne Fabrics always have coupons online! I think I got about a yard of green fabric (maybe two?) and I drew a beanstalk on it that started in the bottom left corner and wound up to the top left corner with my pattern, then back down, then back up… And so on and so forth till I got all the way to the end of the right side. 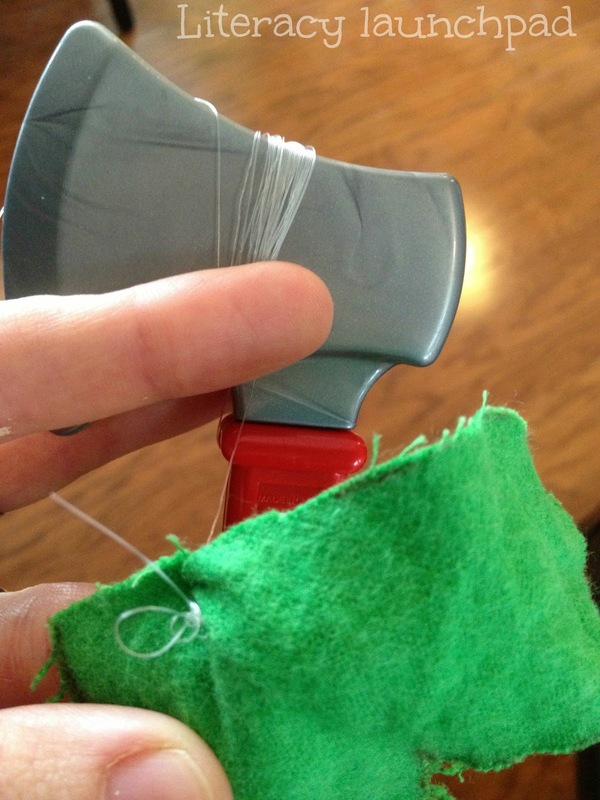 This way you use every bit of your green fabric. It doesn’t matter if your beanstalk is drawn and cut straight across the fabric, because it’s all going to hang from the ceiling anyway and will be straight when it does. You can trace over your penciled pattern with a marker to make it easier to see, and then cut it out. Take the end of your clear thread or fishing line and thread your needle. Poke the needle through one end of your beanstalk. You just need to secure it so it can pull your beanstalk to the ceiling without coming undone. Secure it with a good knot. It doesn’t have to look pretty, nobody is going to see it anyway. It just needs to hold. You’ll have to measure or estimate how tall the ceiling is in the room you’ll be using. 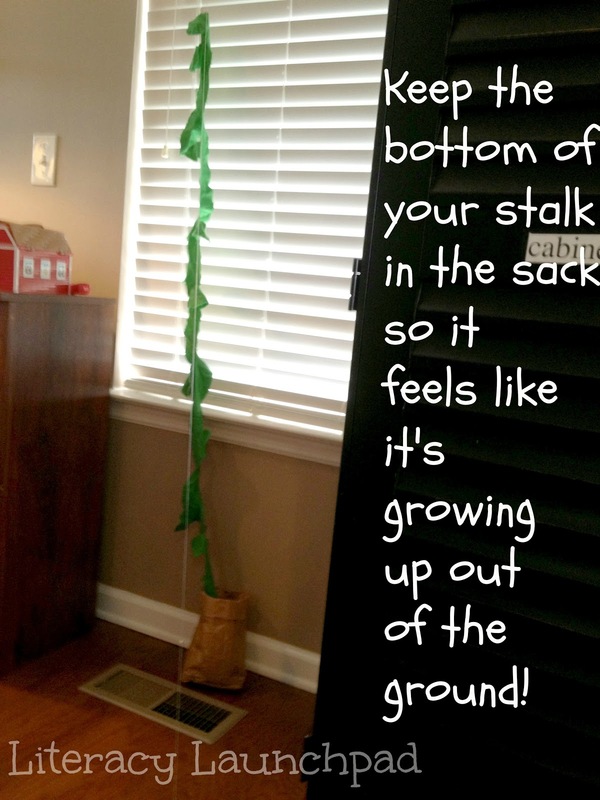 Or how tall you want your beanstalk to grow. 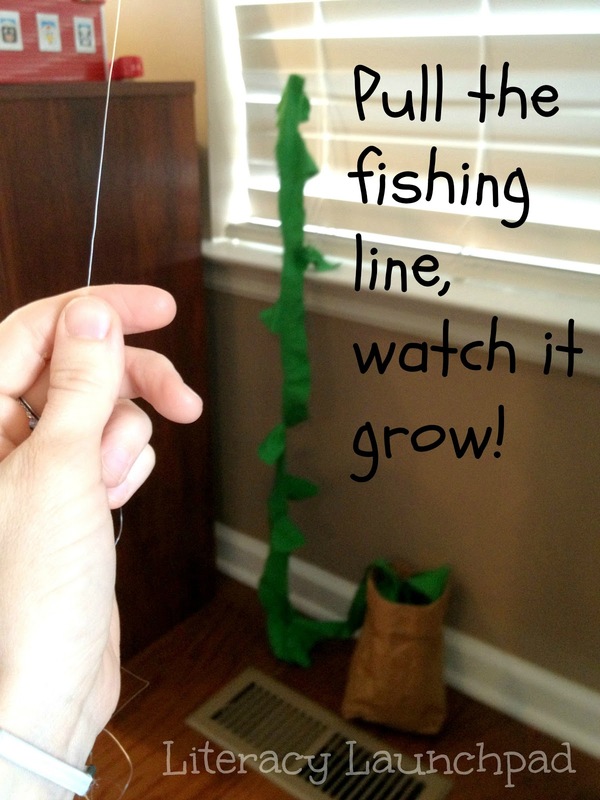 Your fishing line will need to be about twice that length. Tie your washer to the end where you cut it. The washer will weight down your thread so it stays low where you can reach it to pull. It will keep your beanstalk apparatus from falling down before you even begin. If you do not have a drop ceiling to use, you could secure a nail, or 3M hook to the wall to drape your fishing line over. 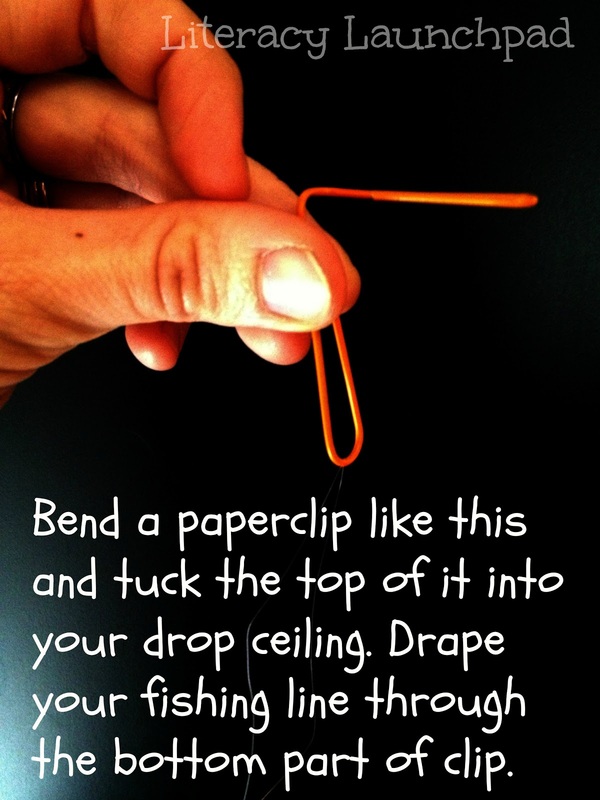 If you do that, you don’t have to worry about using a paperclip. Just make sure your nail or hook is high enough to inspire some awe in your kiddos when the beanstalk grows! 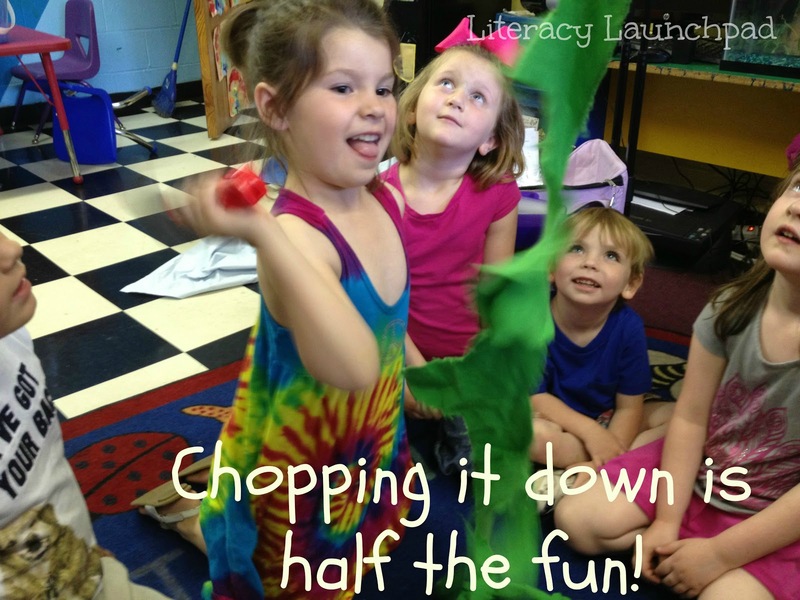 I pull the line and make the beanstalk grow, then “chop it down” myself, when I first tell my students the story. But when the story is done I let each student have a turn to pull the line and make the stalk grow. We pretend they’re Jack and say things as they pull the line like, “Wow, _______, your beans really are growing! 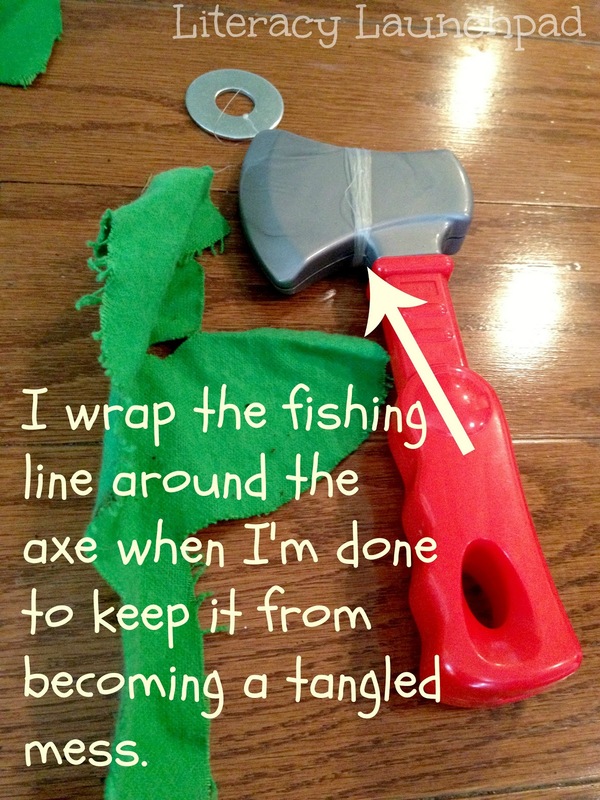 Amazing!” Then I hold the line for them and let them use the toy axe to swing at the stalk and chop it down (let go of the line when you want to let the stalk fall). Be careful when letting them swing the toy axe. I’ve had a student or two get bumped by some very enthusiastic axe-swingers! We do this story the last week of our fairy tale unit, and it’s always a fun finale. I hope it works great for you. Let me know if you have any questions and I’ll do my best to answer them! And let me know how it turns out! 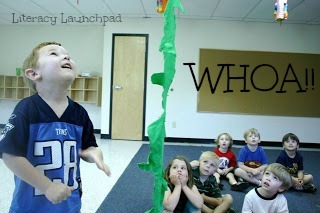 Want more Literacy Launchpad ideas? Subscribe so you don’t miss a thing!